After much anticipated rain last week the Capilano river came up significantly. I went to the beach last Wednesday to check it out and it was a ghost town with no fish in sight. They had all moved up the river. Having said this, don’t think it is over yet as the river will drop again and the fish will accumulate in the estuary if we don’t get more rain. The nice thing about this is the fish that show up will be fresh so don’t wait to see too many jumpers before you cast, look for fining fish. Off the beach the tides are good until September 12th and then from Sep 23 to 27th, the rest of the days in the month will require a floatation device. Mike with a pink landed on a guided beach trip this week. If you’re heading towards Furry Creek, there are still a few pinks to be had but it is tapering off for the season. Another great week of chinook fishing was had from the Bell to the Sand Heads this past week and we had a great time at the Vancouver Chinook Classic as well! I was out for the Vancouver Chinook Classic this past weekend in one of the catch & release weigh boats. On Saturday we ended up having participants fish the N. Arm and the Bell for the most part because of the winds. There were around 80 or so chinook hooked that day, mostly small reds in the 10-15 lb class with a few larger ones. By days end the winning fish were 22, 21, 16 but we still had Sunday’s fishing to contend with. Luckily the winds died down on Sunday and there were a few 19 pound fish caught that took out the 16 pounder in third place. With only minutes left on Sunday we heard Chasin’ Tales call a hook up. It ended up being the winning fish of 24.4 pounds. The angler who reeled it in was David Wei and the guide was Dimitri Roussanidis. 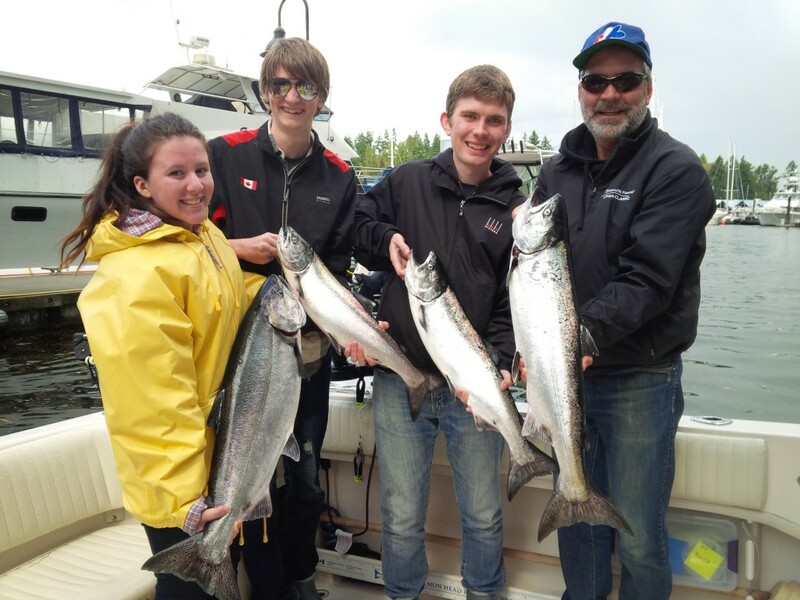 The boat netted a cool $25,000 for first place of which they donated $5,000 to the Pacific Salmon Foundation. All in all the event was a great success and we had a tonne of fun and are looking forward to next year already! Jason with former Pacific Angler staffer from way back Dion – nice fish guys!! We have had a number of trips this week from the Bell all the way down to Sand Heads and for the most part the fishing has been excellent for this time of year. We had all 3 boats out on Thursday and we were all hooking fish at the Bell, N. Arm, T-10 and Sand Heads. We are still seeing a lot of red springs, which is nice for this time of year as we usually start to see some more white springs right about now. Most of the fish we landed this week have been around 12-18 pounds but we did lose a nice one that was high 20’s at the side of the boat yesterday down at Sand Heads, perhaps one of the big white springs we have been waiting for. 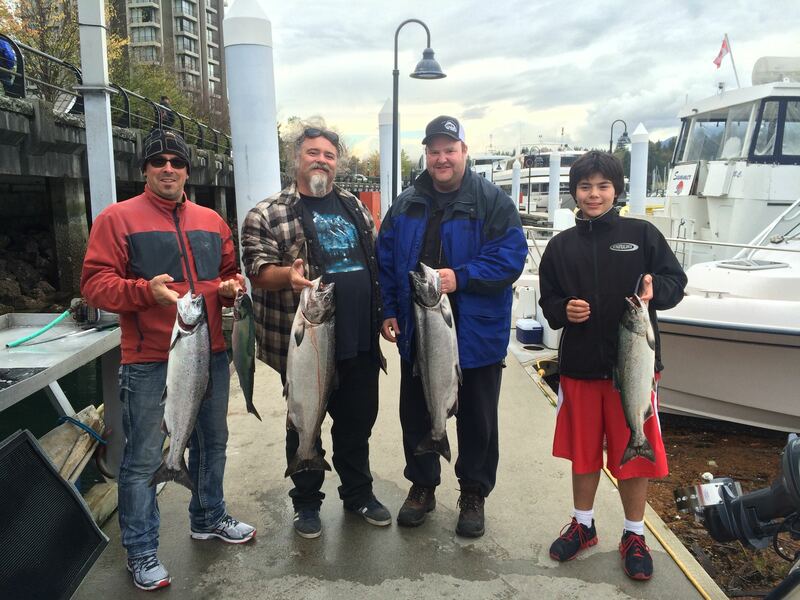 Eddie’s guests beat the rain and are heading home with some great fish! Best depths have been from 40-80 for the most part, with 57 and 67 being hot, but on Thursday the fish were very shallow for a while. We hit 2 fish at 20 feet just putting the first rod down and a few more at 27 so it is worth trying a little shallower early in the day or in lower light conditions. Bait has been the ticket, anchovies or herring, in glow green or glow green chartreuse teaser heads. Glow green and glow chartreuse flashers have been very productive, particularly on the deeper rods, and green onion glow flashers have been good on the shallower rods. Make sure you bring lots of bait if you are heading out all day. We have been going through 20-40 pieces a day. Dimitri’s guests with their catch! 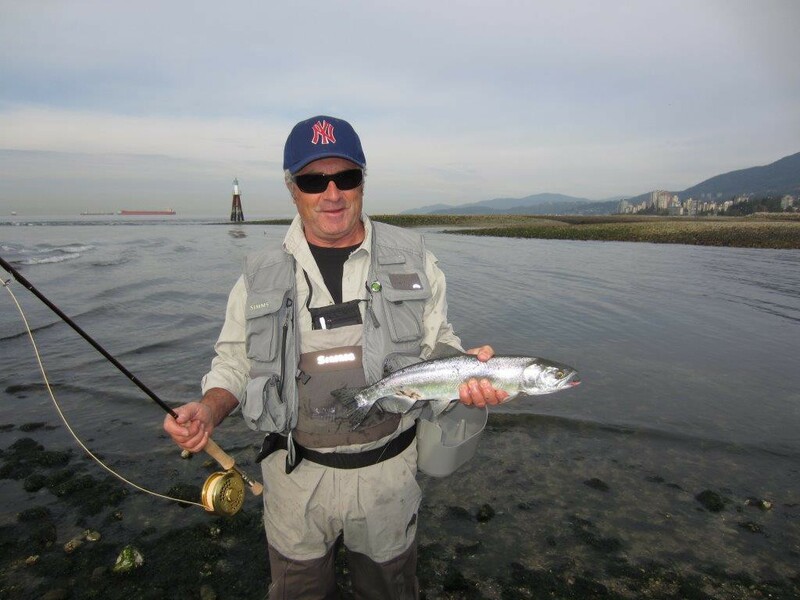 We have been fishing the Fraser Mouth so much lately we haven’t put much time in off the Cap Mouth yet. 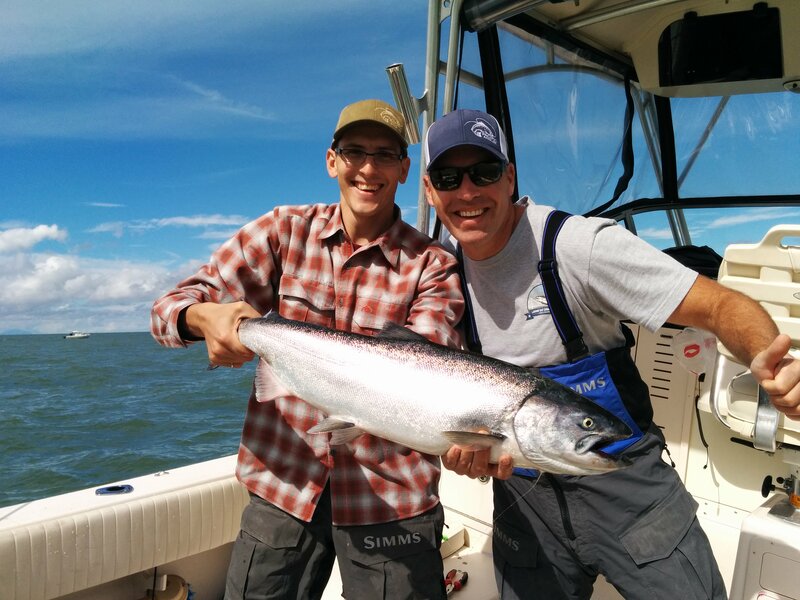 Usually this time of year we have put in a few charters off the Cap Mouth and hooked our fair share of Cap chinook, but this year it has been so hot off the Fraser that most of our guests are booking 8 hour or 10 hour trips so they can enjoy the awesome chinook. If you are looking for a half-day fish, get out there on the flood tide and give the Cap Mouth a try. The river did bump up to 7 the other day, so it was super high, and a bunch of coho did go up the river, but the chinook are coming in each flood tide all through September and October so it well worth fishing this weekend. Bait is the way to go, just like the Fraser fish, the only difference is you want to fish close to the bottom. Drop your gear to the bottom and come up a few feet and you are in the zone.